BRAZIL, IND. – Select U.S. high school students interested in careers in law enforcement will soon spend part of their summers studying and training together in this quaint Hoosier hometown under an agreement signed recently between the National Sheriffs’ Association and Indiana Sheriffs’ Youth Ranch. NSA officials have selected Indiana’s not-for-profit Youth Ranch, a 62-acre retreat under development between Indianapolis and Terre Haute, Ind., as the permanent home for a new, privately funded NSA Youth Leadership Institute. 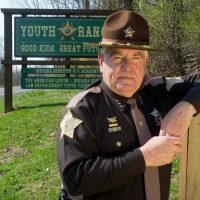 NSA’s Youth Leadership Institute curriculum will mirror that offered to Indiana students attending weeklong Youth Ranch camps and include classes in personal safety, first aid, substance abuse, cybercrimes, bullying, financial fraud, criminal law, firearms safety and crime prevention, Thompson said. Leadership Institute graduates will remain engaged through an alumni association and online continuing education, he added. In addition to their public safety training, young visitors to the Youth Ranch and Youth Leadership Institute will relax by ziplining, horseback riding, swimming, hiking, canoeing, fishing, shooting archery and playing baseball, basketball, volleyball and throwing horseshoes, Layton said.